Heather, I absolutely love this card. I love all of them, but this is special. You make it look/sound so simple, Heather, but the results are stunning. Gorgeous. Love your cards. I always learn something new from your blog. Thanks for sharing. 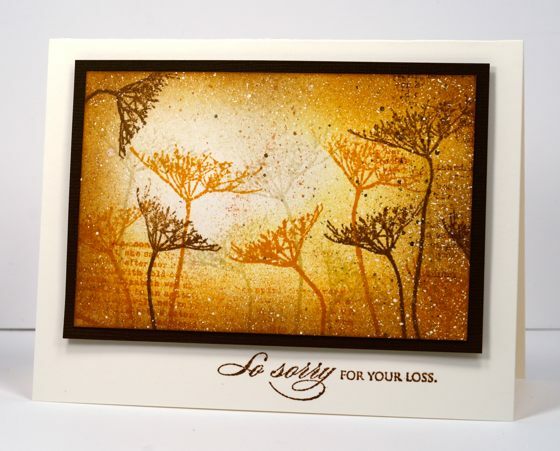 What a lovely, serene-looking sympathy card. Beautiful card. It’s amazing what you can do with just one stamp. What a clever way to make a card that really pops! You are just amazing, Heather. I wish you made video’s of your beautiful work!!! So pretty! Thanks for the tip about bending the stems. I was drawn to the set, but thought it looked a bit to “stalky” to be useful. I now see just how wrong I was. I see this set in my collection in the near future. Thanks for the inspiration.